I have been enjoying listening to audio books for a while now. In fact, I can’t bear to get in the car without one. I never even turn on my car radio anymore. Now I am really in trouble! Someone introduced me to Playaways! These little contraptions, which are available at the public library are a great invention. Pop in a battery, plug in your own head phones and you are ready to go. They are so easy to use and do not go back to the beginning of the book every time you push stop (which is so frustrating!) as so many of the portable CD players I have tried do. Now I can listen to my book all day long! I stick the Playaway which is smaller than my cell phone in my pocket and I am hands free. Yesterday, while preparing dinner, I listened to my book. While making my bed and straightening up, I listened to my book. On the drive to the store, I listened to my book. I was tempted to take it in with me to the grocery store, but decided that perhaps that was going a little too far. It is bad enough when you see people walking around the grocery store, ear piece in place talking into their invisible phone. I can only imagine what people would think of me walking around the store wearing my little pink ear buds as I do my shopping. I think I may be out of control, but this story is just so exciting that I don’t want to turn it off. I sure wish that I had picked up a couple more Playaways! There are so many good ones to choose from. You have got to give one a try! I too have been a bit addicted to audio books, since our book club “read” our first one a few months ago. I love having one to listen to in the car. There are days when I am in the car for so long and I love that I get to read a book while I am doing all that driving. Right now I am listening to “Room” and am really drawn in. So thanks for this, Susan. This sounds like a wonderful alternative. Hi Janine! I thought that Room was an exceptionally well done audio book, as was The Guernsey Literary Potatoe Peel Society. 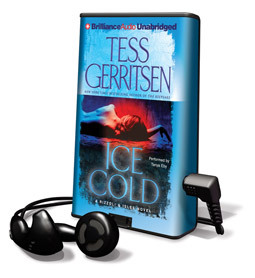 I am heading to the library first thing Monday to pick up another audio book…hopefully a Playaway! I have also become semi-addicted to audio books. I just finished The Lost Symbol by Dan Brown, of The DaVinci Code fame. It was a very long, complicated and suspenseful story about the secrets of the Masons and our country’s founding fathers in Washington DC. I doubt that I would have finished it if I was reading rather than listening to it. I’m going to look for the Playaway. Sounds great! Thanks for the information, I am going to the library tomorrow and look for Playaways.